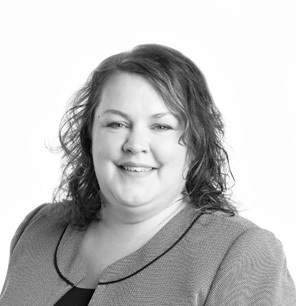 On Tuesday, September 26, 2017, BCGL employment and labor attorney Angela Sanders presented "OSHA Compliance for the Small Business Client" at the Lancaster Bar Association. It's a common misconception that OSHA applies only to businesses in manufacturing, construction and other trade industries. In reality, all employers, even those whose work takes place in small office settings, are subject to OSHA. Over the past few years, OSHA has expanded regulations which impact small employers and created new compliance obligations. It is important for employers to to understand their safety obligations and compliance requirements to avoid an OSHA inspection and enforcement. 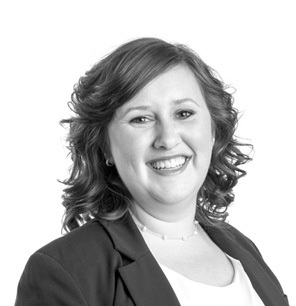 To learn more about how OSHA may impact your business or BCGL's employment law services, contact Angela Sanders at 717-945-5762 or AngelaS@bcgl-law.com. This entry was posted in Employment on October 3, 2017 by BCGL Law. 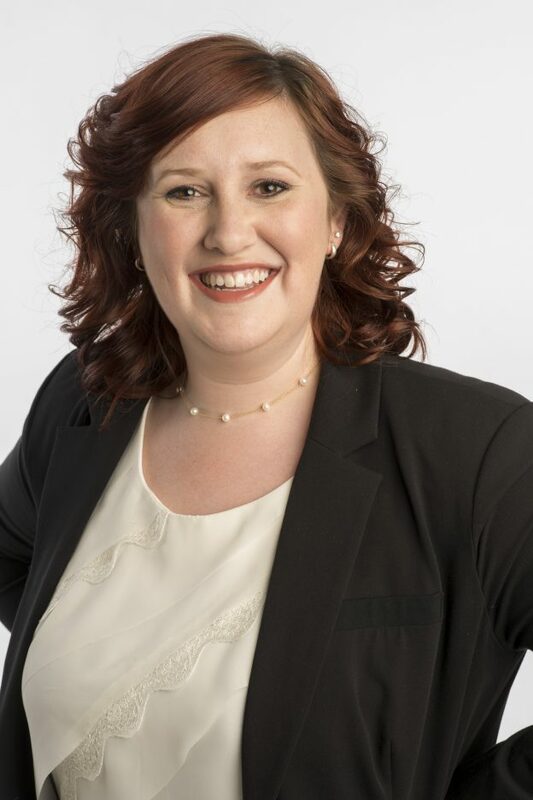 BCGL Associate and member of the Employment and Labor Law Department, Angela Sanders, published an article titled “Making Workplaces Great Again?” in the September/October issue of Lancaster County Woman. You can read the full text of the article by picking up a complimentary copy of the journal, visiting the Lancaster County Woman website, or clicking here. 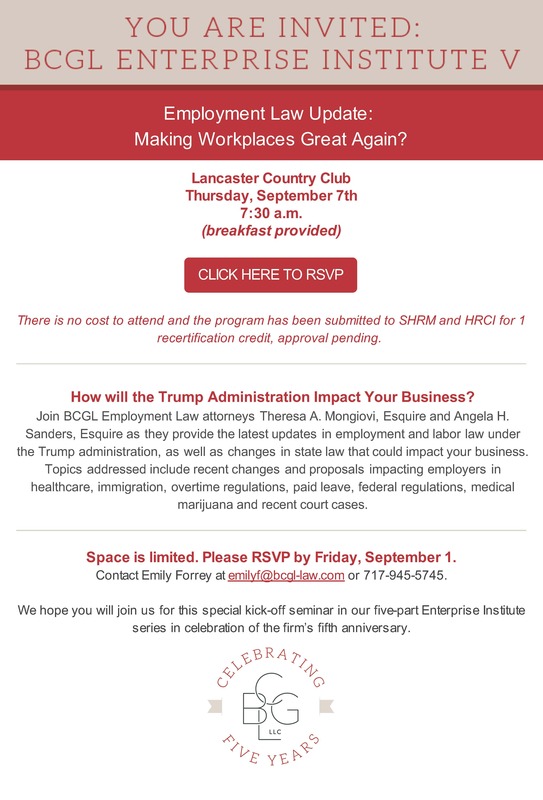 This entry was posted in Articles, Employment and tagged BCGL Law, Enterprise Institute, Lancaster County, Women Leaders on September 18, 2017 by BCGL Law. This entry was posted in Employment, Firm News, Seminars, Uncategorized on August 15, 2017 by BCGL Law. How Do Attorneys & Forensic Accountants Work Together in a Fraud Investigation? On July 10, 2017, Theresa Mongiovi, Partner at BCGL and Chair of the Labor and Employment Group, co-presented a seminar entitled “Fraud Alert: Outing an Inside Job” with Lisa Myers, Principal of Boyer & Ritter, LLC and leader of the firm’s Forensic, Litigation Support and Consulting Group. Mongiovi and Myers presented the seminar at PICPA’s (Pennsylvania Institute of Certified Public Accountants) Government Accounting Conference in Hershey, PA. Their session covered how to respond when fraud is discovered, real-life examples and steps in conducting a fraud investigation, and how forensic accountants and counsel work together during this process. For more information, please visit PICPA.org. This entry was posted in Employment, Firm News, Seminars and tagged Accounting, Chairwoman, Confrence, Fraud Alert, Fraud Investigation, Governmental Auditing, Hershey PA, Labor and Employment Group, Pennsylvania Attorney, PICPA Confrences on July 11, 2017 by BCGL Law.